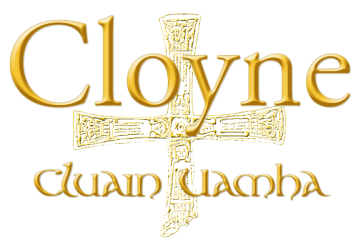 Cloyne is fortunate in possessing an 11th century Round Tower in a very good state of preservation. 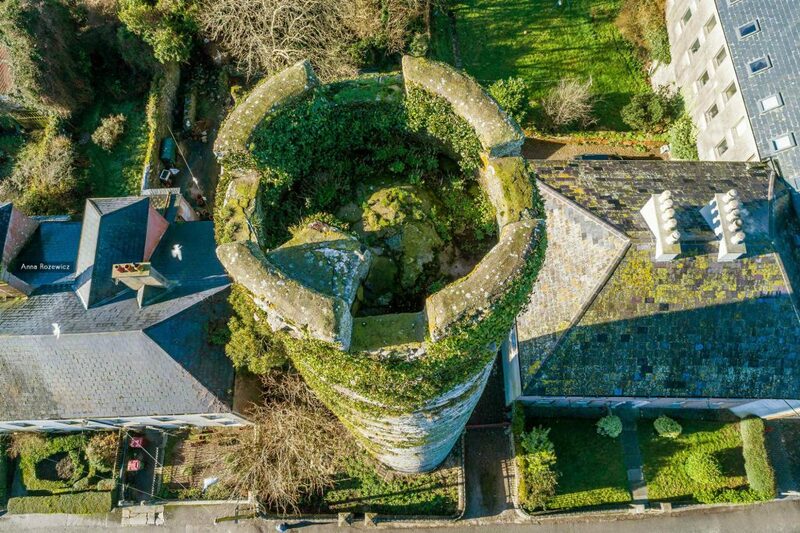 Although it is currently inaccessible to visitors, Cloyne District Community Council is currently exploring options to open the tower to the public once more. 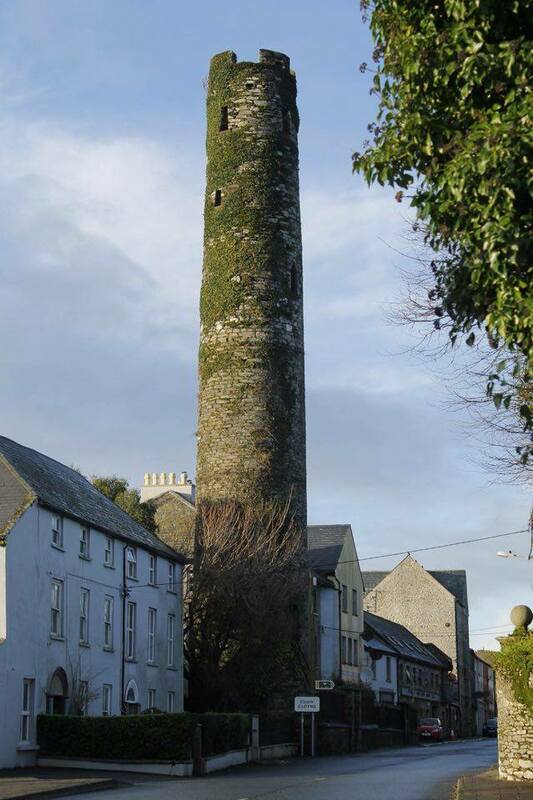 It is one of two Round Towers in Co. Cork (the other being the ruined tower at Kinneigh). On a map of the old cemetery and a ground plan of the Cathedral made in 1743 ‘the Steeple’ is stated to be 102ft high and from the ground to the bottom sill of the door 4 yards high. It was also noted on the map ‘that the distance from the Steeple to the Church door is 47yds, 2ft and 9 inches and that the wall of the ground floor in the cleere of the Steeple is 10ft‘. Barrow gives its height as 31.2m in 1985. “Ancient tower at Cloyne.” Painted by Sir Edward Fanshawe in 1856. The Tower is divided into 7 storeys, the first beginning at door level which is 13ft from the ground and facing south east. The door was at one time approached by a flight of stone steps. In the chapter records for 1795, reference is made to the Steeple steps. There is a window on every storey, all facing in different directions and of a different size, except on the top storey where there are four windows facing north, south, east and west. The most remarkable window opening is on the fifth storey: angular-headed on the outside but semi-circular-headed on the inside. The next mention of the Tower in the Chapter records is of 1841 when permission was granted to the Munster Antiquarian Society to make excavations within the Tower. It is said that as a result of these investigations three skeletons were discovered, laid east and west, two lying side by side and a third a few feet underneath. Widely divergent views were put forward as to their uses e.g. fire temples, astronomical observatories, phallic emblems or Buddhist temples, penitential prisons, beacons and watch towers, belfries, keeps, monastic castles and penitential prisons. Round Towers are grouped into four styles, Cloyne and Kinneigh being of the third style with ‘stones laid in horizontal courses, well dressed and carefully worked to the round and batter, the whole cemented in strong, plain mortar of lime and sand‘. This would place their construction in the 11th century, before that of Ardmore, Co. Waterford. 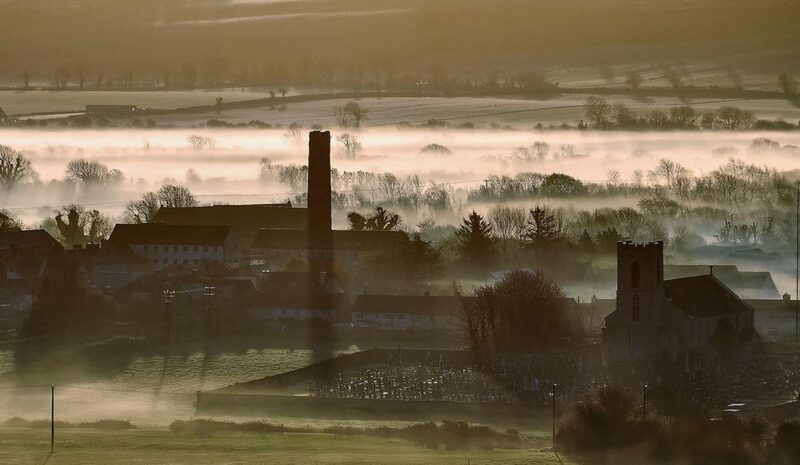 A great restoration of monasteries took place in Ireland between the years 996 and 1008AD, when King Brian Boru secured a temporary peace from the Danes and to this period and two following centuries, the erection of the Round Towers, half strongholds and half belfries, may be safely assigned. Read more about Cloyne’s Round Tower here and here.